I’ve been all about doing Pinterest inspired projects lately. I started my “Pinterest Made Me Do It” Monday blog posts and I’m really liking them. Last week (or was it the week before), YHL and Katie Bower posted about the “Pinterest Challenge – Spring Edition. I’m followers of both their blogs and knew I would have to join the challenge. 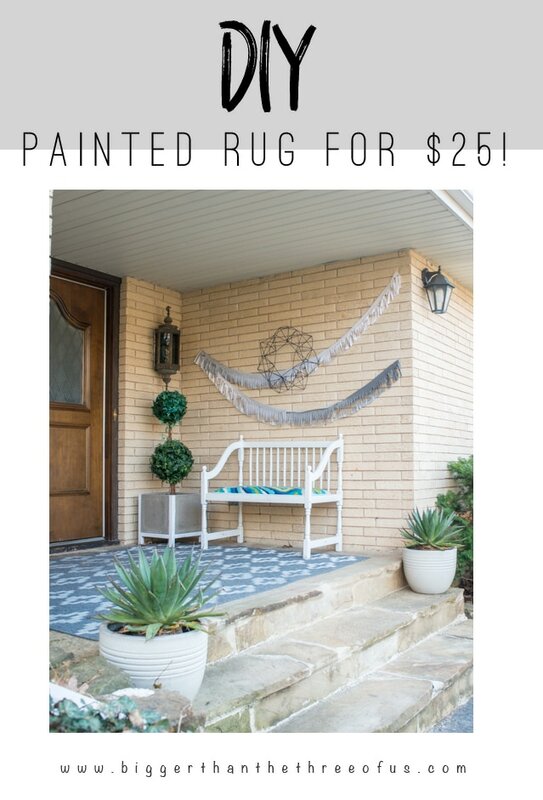 I wanted to do something fun and I decided to do a DIY Painted Outdoor Rug. It’s hosted by: Young House Love, Bower Power, Red Bird Blue, and Sparkle Meets Pop. 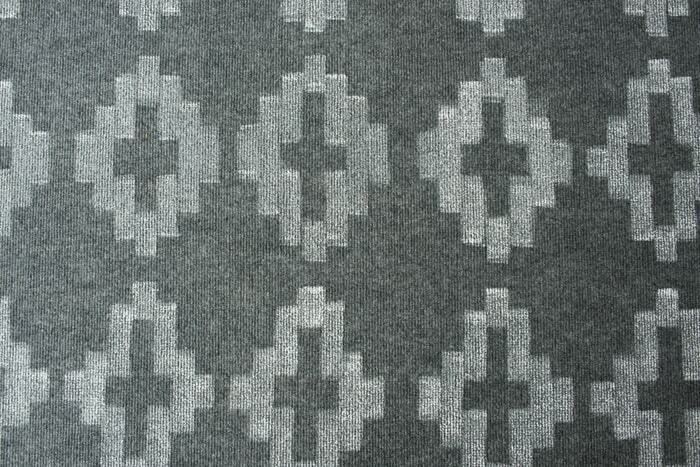 I’ve been intrigued by people painting rugs. 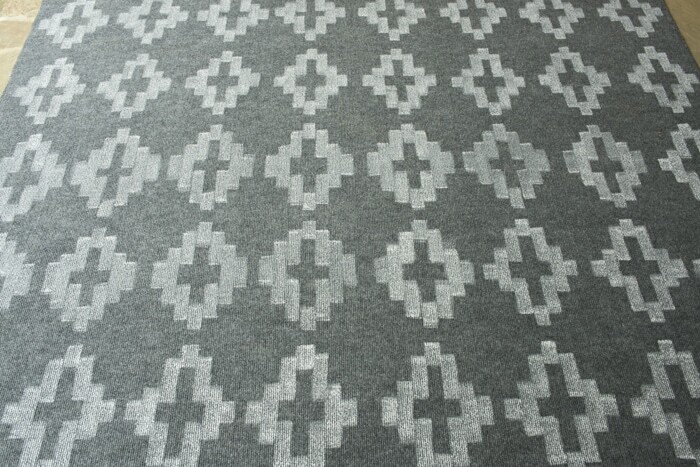 I have a few different pins of painted fabric rugs and doormats. I saved this pin because I loved how economical it was. 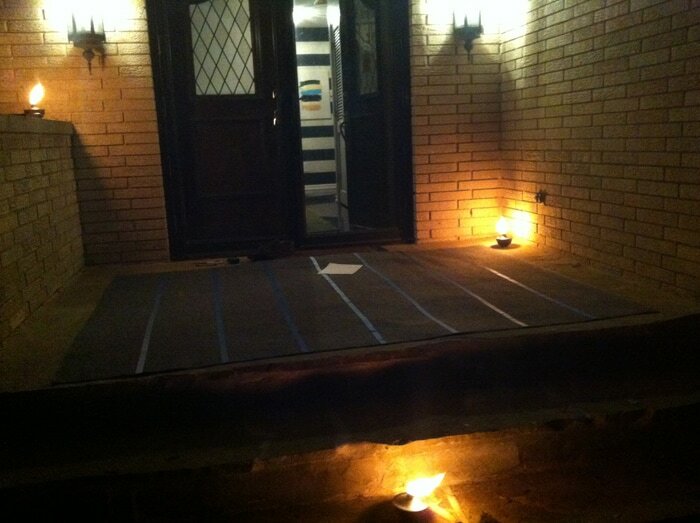 They used a cheap indoor/outdoor carpet rug from Home Depot. 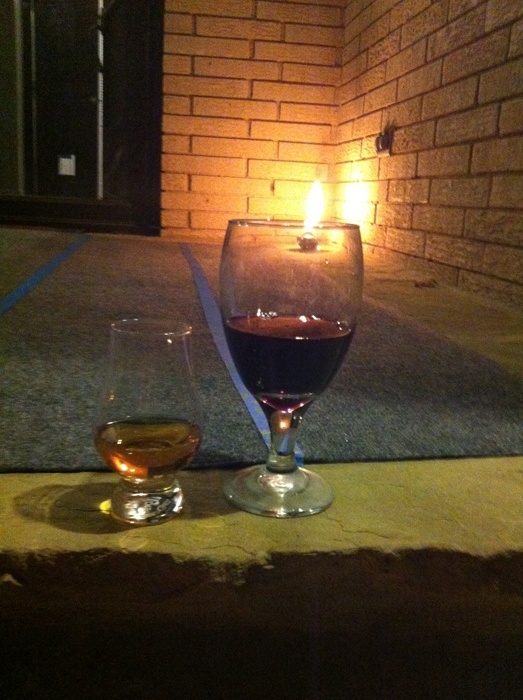 We desperately needed to start sprucing up our front porch and I knew this was the place to start. While thinking about the design I wanted, I thought of this on Merrypad. 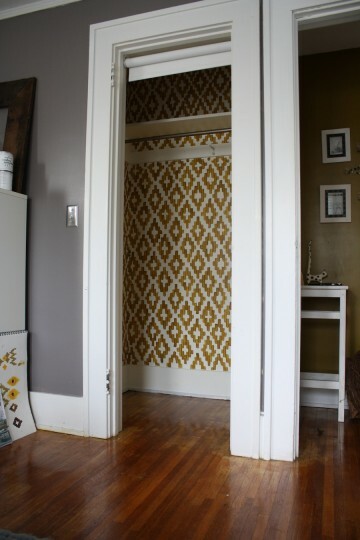 Isn’t that hand-painted closet killer? I’ve been in love with it ever since I first saw it. Now, to implement that on a rug. 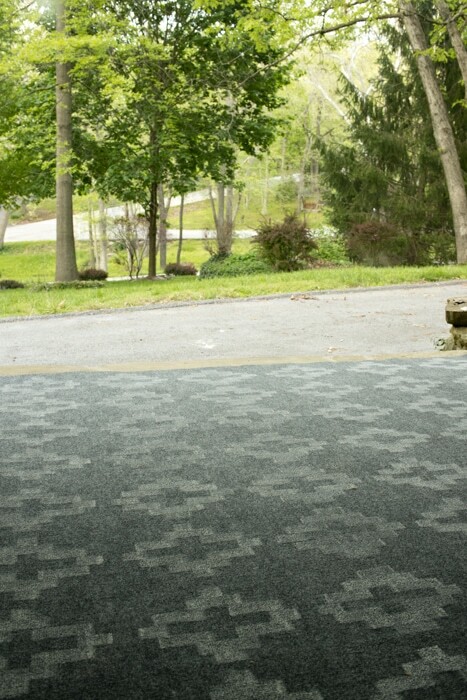 I headed to Home Depot and bought a 5×8 indoor/outdoor rug for around $15. Then, I bought outdoor white paint for $8. 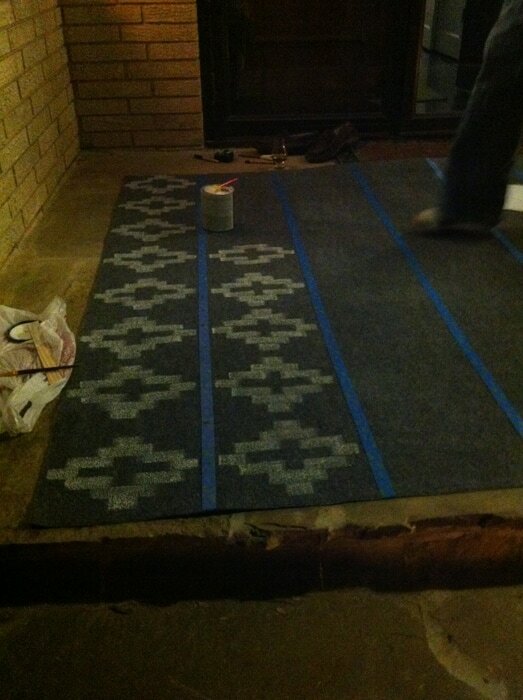 We started taping off lines and started from there (all people with toddlers do projects at night, right?). We stopped at that point and decided to finish the next day. Finished! So, the design isn’t perfect, but I think it still looks great. About 3 hrs of work and $24 dollars. Not bad. 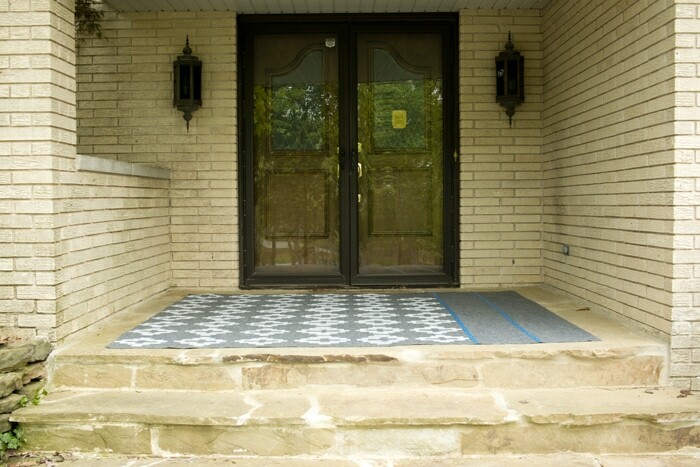 =) Now, we need to add plants and some color to our porch.